This Market Barrier have a Printed Banner Using a Dye-Sublimation Process for High-Quality! Stainless steel displays have multiple configurations, & are able to be used outdoors! Market Barrier has Chrome Finish! This market barrier features digitally printed graphics using a dye-sublimation process on nylon weave banners. The durable banners display your custom designs in vivid detail and full colour to really capture attention. Printing is done on two separate banners that are then sewn together to prevent a mirror image from being shown, creating an effective dual-sided display. The market barrier also has a single-sided option available. With logos that only have one or two colours and full-colour photographic versions able to be printed, these banners can print nearly anything. The market barrier uses nylon-weave banners that help keep wind from reaching patrons as they sit and enjoy the outdoor weather. The hard-wearing fabric allows these promotional barriers to be used in nearly any location without worry of breakdown over time! 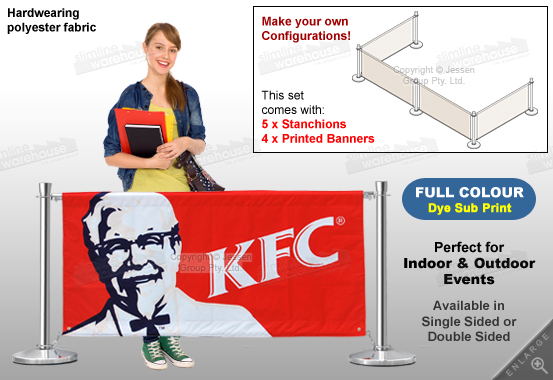 The promotional banner, market barrier includes (5) posts and (4) banners with your purchase. Different configurations can be created, allowing your business to create a suitable outdoor seating area for patrons, or help create a queue for your business. 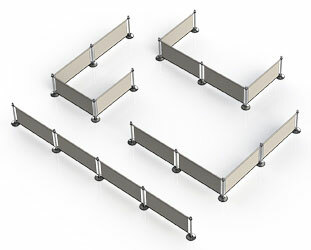 The market barrier is easy to set-up and break down, providing an ideal display for the fast paced service world. A plastic ring is on the bottom of each post to help prevent damage to floor surfaces! 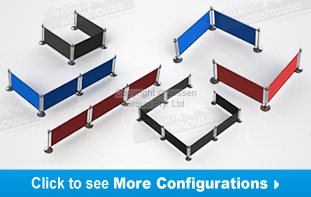 With many promotional barriers, our range is sure to have something that works for you. We have an entire line of accessories, and the different configurations can be assembled to suit the needs of your business without issue! 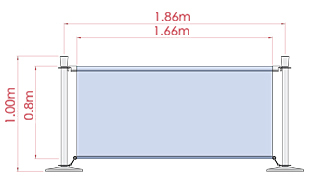 The cafe barriers prevent breeze from affecting customers in your outdoor area. The display has a printed banner using a dye-sublimation process to have a vivid representation of your graphics. The digitally printed banners are dual-sided, with two banners sewn together in order to prevent mirroring. This banner features easy assembly, and is perfect for showing your logos while still able to prevent wind from reaching customers! By using custom graphics that have been printed using the dye-sublimation process, you are ensuring a purchase that is high quality with full colour imagery used. Purchase this display to show your graphics in a professional manner. The kit include (4) banners & (5) posts. The fabric banners are made from nylon-weave fabric, with the posts being stainless steel with a polished chrome finish! Our online catalogue is your portal to our huge range of products, with hundreds of different items available to use in a a variety of businesses. Slimline Warehouse has high-quality products sold at low prices to keep customers coming back. We despatch these displays and most other in stock items same day when purchased by 1pm EST to anywhere in Australia!